Now recruiting new members from Year 6 upwards! 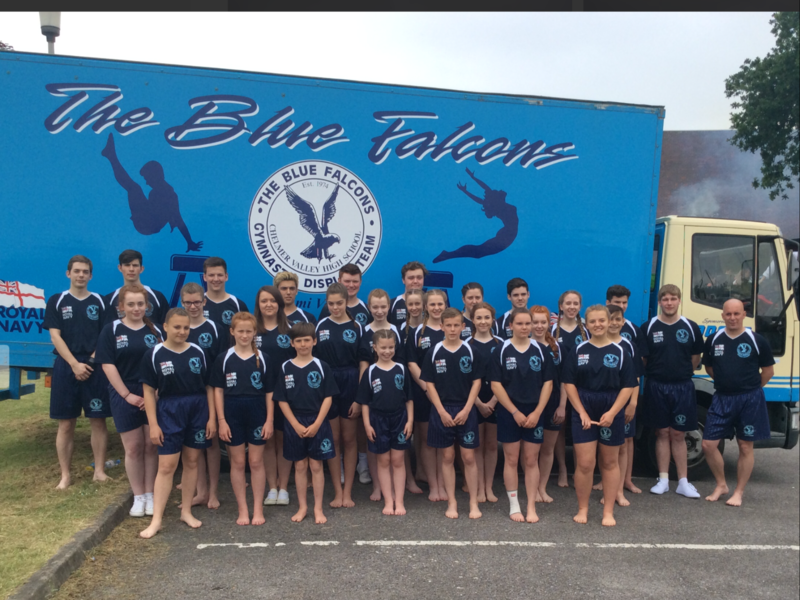 The Blue Falcons Gymnastic Display Team was founded in 1974 by retired Team Manager Mick Ford, (now run by retired senior gymnast Gary ‘Bouncing Bomb’ Steggall) and consists of students from Year 6 up to adults. Based at Chelmer Valley High School the team train two evenings a week. 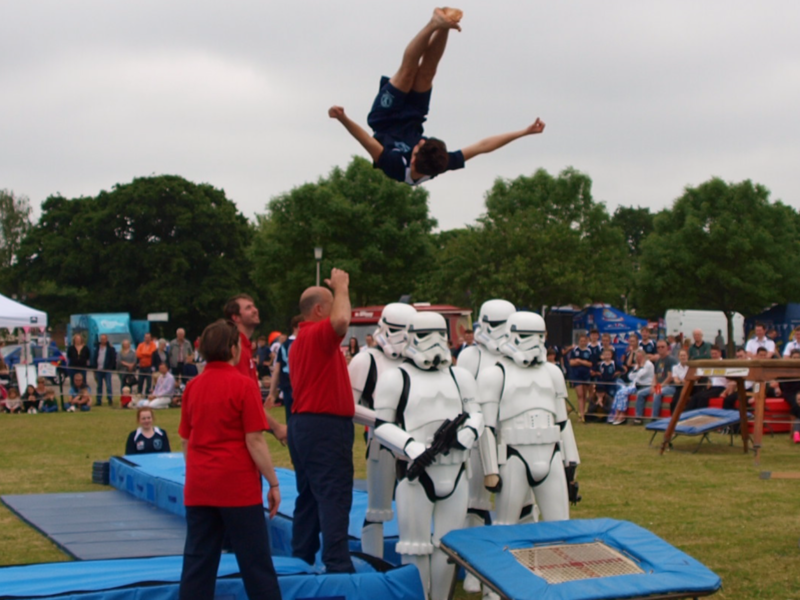 The main format of the displays is based on the Armed Services form of gymnastic displays, therefore vaulting provides the basis although there is no limit to the type of vaults performed over equipment or people, or both including Carnival Queens, members of the Armed Forces and even Star Wars Storm Troopers. The team have been entertaining audiences large and small for over 40 years with their displays at various venues from local primary school fetes, town carnivals to Royal Naval Open Days and International Military tattoos. Over the years the team have made many appearances on both local and national television programmes including Anglia News, Look East, Blue Peter and Children in Need. 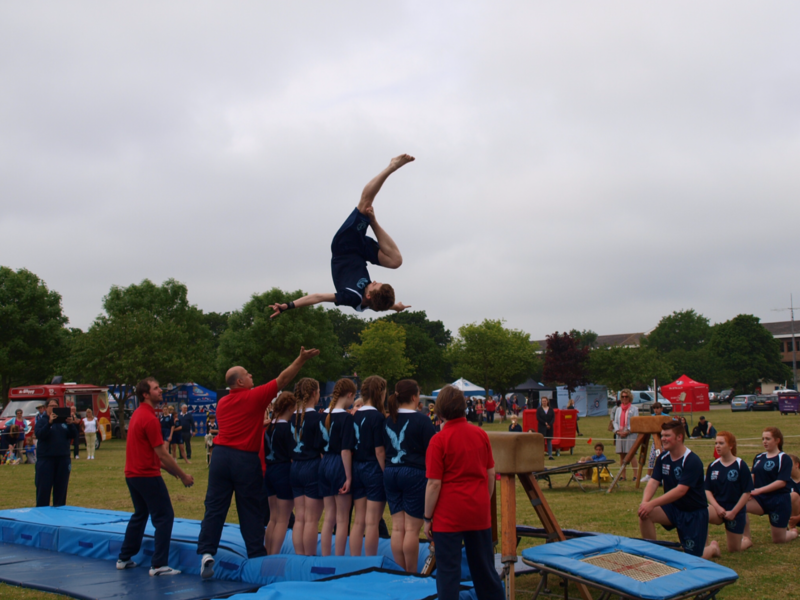 The Blue Falcons Gymnastic Display Team have also been fortunate enough to receive awards in recognition of its work and achievements including Chelmsford Borough Council Award for Youth and the Essex Sports Award. In 1999, the team’s 25th year, we successfully achieved an official Guinness World Record for ‘The Most Vaults in One Hour’. A team of ten amassed a total of 4095 vaults over one piece of equipment non-stop for an hour. We have since broken this record TWICE and in September 2009 set the current record of 6250 vaults in an hour raising over £2000 which was shared between two charities; DebRA (a charity helping children and adults with a skin blistering disease and The Burned Children’s Club). A 12 hour sponsored vault in April 2007 produced a total of 132,000 vaults and proceeds from this was enough to purchase much needed equipment for the team plus donate funds and gifts to the new natal and children’s wards of 2 hospitals. The Blue Falcons are very proud to have been able to donate over £50,000 to charities and good causes over the years. Our younger team The Fledgling Falcons train one night a week to start with, gaining confidence and competence with which they can then make the transition into the main team. Anyone interested in trying out for The Blue Falcons is welcome and can find out more details through our Join Us contact page on our website. Experience is not necessary as full training will be given. The main basis of The Blue Falcons Gymnastic Display Team is to give youngsters an opportunity to build self confidence, enjoy being part of a team, perform in public and have fun! Above all, be proud to be a Blue Falcon. The Royal Navy, Lodge Coaches, GKS Tree Care and Webwax. Thanks also to Chelmer Valley High School. Become part of a winning team!